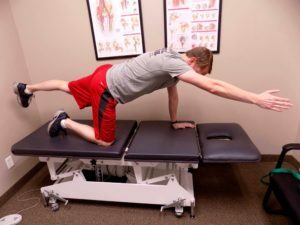 Just like any building requires a strong foundation, our bodies require a strong, efficient core to let us move appropriately! 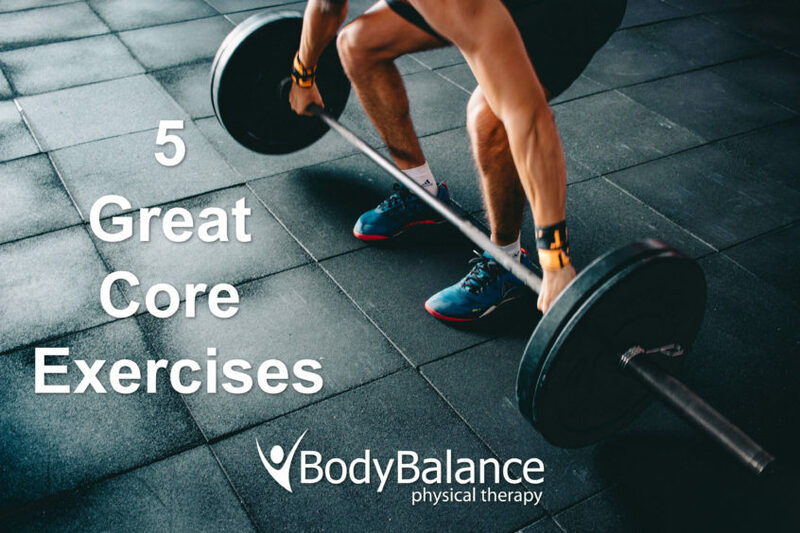 Having a strong core is more than just having a six pack. 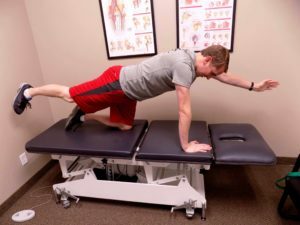 Your core muscles include not only all four layers of the abdominal muscles, but also the glutes, small muscles along the spine (called local stabilizers), and even the diaphragm. 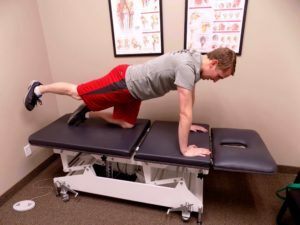 If these core muscles are weak or uncoordinated, your body will move inefficiently, which increases pressure on spine and hip joints and causes pain. 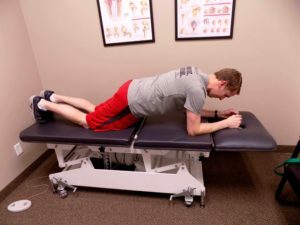 Weaker core muscles can also affect performance during higher intensity activities (such as sports) because the limbs do not have a stable base from which to produce movement. 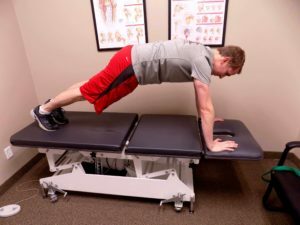 Core training works best when it is a gradual progression in intensity and difficulty. 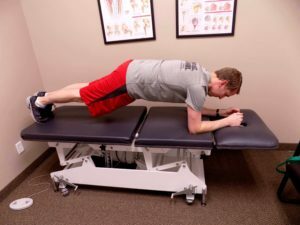 The exercises described here are intended for those who already have a baseline level of core strength. 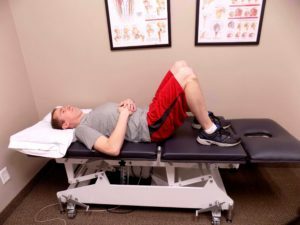 If you experience pain while doing these, you should stop and give us a call. 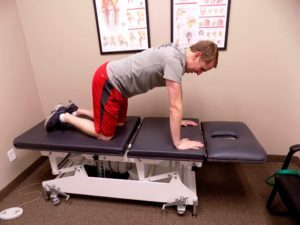 We can provide you with a thorough assessment and recommend more appropriate exercises in order to reduce pain and help you move more and live more! Lie on your back with your hands by your sides, your knees bent and feet flat on the floor, making sure your feet are directly below your knees. Tighten your abdominal and buttock muscles, and then raise your hips up to create a straight line from your knees to shoulders. Squeeze your core and try to pull your belly button back toward your spine. Maintain a straight line from your shoulders to your knees and hold for 5 seconds. Repeat 15 time. Standing parallel to your cable machine, hold the handle in both hands at chest height. Position yourself a few feet away from the cable to add tension. 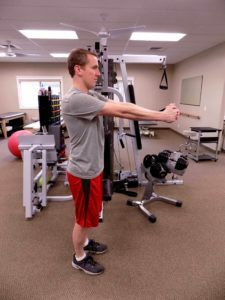 Make sure your feet are hip-width apart and your knees are just slightly bent, then bring the handle up to the center of your chest and press out, extending your arms fully. Return your hands to your chest and repeat for 15 to 30 reps on each side. Get into pushup position on the floor, bend your elbows 90° and rest your weight on your forearms. Your elbows should be directly beneath your shoulders, and your body should form a straight line from your head to your feet. Be sure to avoid the hips sagging down or pointing up in the air. Hold the position for 30 seconds initially, then work over time to increase your hold time up to 2 minutes. Start down on the floor on your hands and knees in push up position. Keep the core tight without holding your breath. Your body should be in a straight line from your head to your heels without hips sagging or pointing up. Bring one knee up and in toward your midsection, bringing the knee forward in one smooth, controlled motion. Return to starting position and repeat with your other leg. 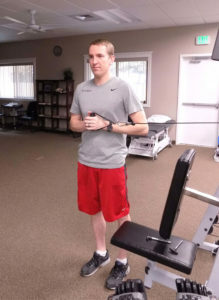 Repeat this exercise by alternating sides for either 1 minute or 15 times with each leg. Kneel on the floor or soft surface with knees hip-width apart and your hands firmly placed on the ground at shoulder width. Lift one hand and the opposite knee off the floor while balancing on the other hand and knee and keeping your weight centered. Point the arm out straight in front and extend the opposite leg behind you. To ensure proper form (one straight line from your hand to your foot) reach back behind with the foot and not up toward the ceiling. Do your best to avoid allowing the hip to drop or twist. Hold for 2-3 seconds then return your hands and knees to the starting position. Repeat 5-15 times on each side, 10-30 total. 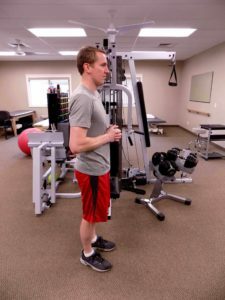 This blog is designed to provide general information on pertinent physical therapy topics. The statements made are provided for educational purposes only. They do not constitute medical advice nor do they necessarily reflect the views of Body Balance Physical Therapy or any of its therapists other than the author. This blog is not intended to create a therapist-client relationship between you and Body Balance Physical Therapy. 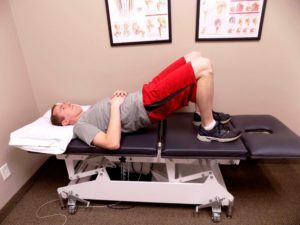 If you have specific questions as to the application of this information to your medical condition, you should seek the advice of your physical therapist.